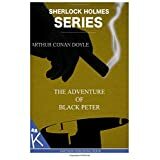 About the Book: "The Adventure of Black Peter" is a Sherlock Holmes story by Arthur Conan Doyle. This tale is in the collection The Return of Sherlock Holmes, but was published originally in 1904 in the Strand Magazine and Collier's. My Review: This is a good story with a nice plot: Forest Row in the Weald is the scene of a gruesome harpoon murder, and a young police inspector, Stanley Hopkins, asks Holmes, whom he admires, for help. Holmes has already determined that it would take a great deal of strength and skill to run a man through with a harpoon and embed it in the wall behind him. Peter Carey, the 50-year-old victim and former master of the Sea Unicorn of Dundee, was a most unpleasant man, especially when he was drunk. He had a reputation for being violent, even having been prosecuted once for assaulting the local vicar. His daughter is actually glad that he is dead. She and her mother have endured years of abuse from the old whaler and sealer, who moreover had some remarkably peculiar habits. He did not sleep in the family house, but in an outhouse that he built some distance from the house, and which he decorated to look like a sailor’s cabin on a ship. This is where he was found harpooned. Hopkins could find no footprints or other physical evidence. A tobacco pouch was, however, found at the scene, made of sealskin and with the initials “P. C.”, and also full of strong ship’s tobacco. This is curious, as Peter Carey — Black Peter as people called him — seldom smoked. Indeed, Hopkins found no pipe in the cabin. The only clue from an eyewitness comes from a stonemason named Slater, who says that he saw the shadow of a head on the blind in one of Carey’s cabin windows, and he is sure that it was not Carey. The next day, Carey was in his foulest mood, and then early the next morning, at about two o’clock, his daughter heard a scream from the direction of the cabin, but took no notice. Carey often screamed when he was drunk. The murder was not discovered until about midday, when the ladies summoned enough courage to look in on him. Hopkins was soon on the scene. Carey was fully dressed, suggesting that he was expecting a visit, and there was some rum laid out along with two dirty glasses. There were brandy and whisky, too, but neither had been touched. There was also a knife in its sheath at the dead man’s feet. Mrs. Carey has identified it as her husband’s. A little notebook was found at the scene. It contains the initials J. H. N. and the year 1883. It also says C. P. R. on the second page, which Holmes reckons stands for Canadian Pacific Railway. The first set of initials is likely a stockbroker’s, as the little book is full of what appears to be stock exchange information. Holmes decides to accompany Hopkins to Forest Row, and upon arrival, Hopkins observes that someone has tried to break into Carey’s cabin, but failed. Holmes believes that the burglar will likely try again, this time bringing a more useful tool for the job. After examining the inside of the cabin, Holmes observes from the lack of dust that something has been taken from a shelf, even though the burglar did not get in. It was a book, or possibly a box. Holmes, Dr. Watson, and Hopkins all lie in wait for the burglar that night, and they are not disappointed. Along he comes, he breaks into the cabin, and goes through one of Carey’s old logbooks, cursing when he finds that the information that he wants is missing, having been torn out of the book. As he is leaving the cabin, Hopkins moves in and arrests him. He is John Hopley Neligan — which matches the initials in the notebook — the son of a long-vanished, failed banker. He claims he was looking at Carey’s logs to test a theory of his. His father disappeared with a box full of securities after his bank failed. He took them on a yacht bound for Norway. He believes that his father’s boat may have been driven north on the North Sea by bad weather, and met the Sea Unicorn, captained by Carey. He believes that Carey knew something about his father’s disappearance, and that possibly his father was murdered by the man who has now himself become a murder victim as he has traced some of his father's long lost securities back to Carey. Hopkins takes Neligan off to the station, even though Neligan swears that he has nothing to do with the murder. Holmes believes this to be true. Neligan is, after all, a slight, thin man, hardly capable of running a man through with a harpoon. Furthermore, that kind of attack requires a practiced wielder such as a professional harpooner. Holmes saves Neligan from the noose by finding the true killer in a most unusual way. He advertises for a harpooner, posing as a sea captain named Basil. 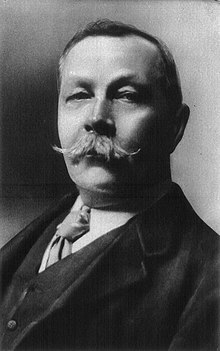 He gets three applicants at 221B Baker Street for the job, and one of them is indeed Peter Carey’s killer, as confirmed by his name, Patrick Cairns (the tobacco pouch was his, not Carey’s), and the fact that Holmes had established that he was once Carey’s shipmate. Holmes also felt sure that a murderer would want to leave the country for a while. Holmes handcuffs Cairns unawares, but the latter furiously denies that he murdered Carey, claiming self-defence, as Carey was reaching for his knife. He was actually at Carey’s cabin to extort hush money from him. Neligan’s father had indeed come aboard the Sea Unicorn with his tin box of securities, and Carey had murdered him by throwing him overboard while no-one was looking (but actually, Cairns had seen). Carey did not take kindly to being forced in this way by his old subordinate, prompting Cairns to take the action that he did after Carey draws a knife on Cairns.. The rum was another clue. Holmes was sure that it, and the fact that the brandy and whiskey had been left alone, were sure signs that the murderer was a seaman. Neligan is released and the securities returned to him-although those Carey had sold cannot be recovered. I recommend this book to all readers who appreciate a well written mystery story, mainly for those who love Sherlock Holmes.